Hi, I’m Jeff Kavanaugh. As Director, I have the privilege of overseeing this incredible group of students, staff members, and faculty members as they make their way across the icefield. I am an Associate Professor in the Department of Earth and Atmospheric Sciences at the University of Alberta, where I investigate the dynamics and hydrology of glaciers and their response to climatic change. This research has taken me to glaciers in Alaska, British Columbia, Yukon, the Canadian Rockies, Arctic Canada, and Antarctica. This is my eleventh summer on the icefield, where my primary role is to maintain the buildings and snowmobiles. My background is in carpentry, chemistry, electric wiring, furnace-cleaning, public relations, teaching, maple syrup production, and scientific logistics. This fall, I’m starting a Master’s in Earth Sciences at the University of Maine in Orono. Hi, I am Stanley Pinchak. It is my pleasure to again join JIRP as auxiliary staff, and as member of the JIRP Temperature Project this field year. I enjoy sharing my knowledge and Icefield experiences with the students as well as learning from them. It is the opportunity to learn from the staff, faculty, and students which brings me back. Having the chance to get in some turns over the summer is an added bonus. Hi, my name is Jon Doty. I am currently working on a Master of Forestry degree at the University of Maine. I was a 2013 JIRPer, and was thrilled to join safety staff this year and complete another traverse. After such a low snow year this winter, the icefield may be very different; I am excited to observe these changes and facilitate a safe and enjoyable crossing for everyone. Jon Doty by Molly Blakowski. My name is Annie Boucher, I grew up in Brooklyn, NY, and went to college at Carleton College in Minnesota. I just finished my first year of teaching elementary and middle school science in New York City, and I’m excited to start my Master’s in Earth Science at UMaine in the fall. This is my third summer with JIRP, and I’m most excited about getting to know all of the fabulous students this summer while we dig snow pits! Hi my name is Mary Gianotti. I grew up in Juneau and will be a senior next year at Boston University with a major in Earth Science and a minor in Environmental Science. 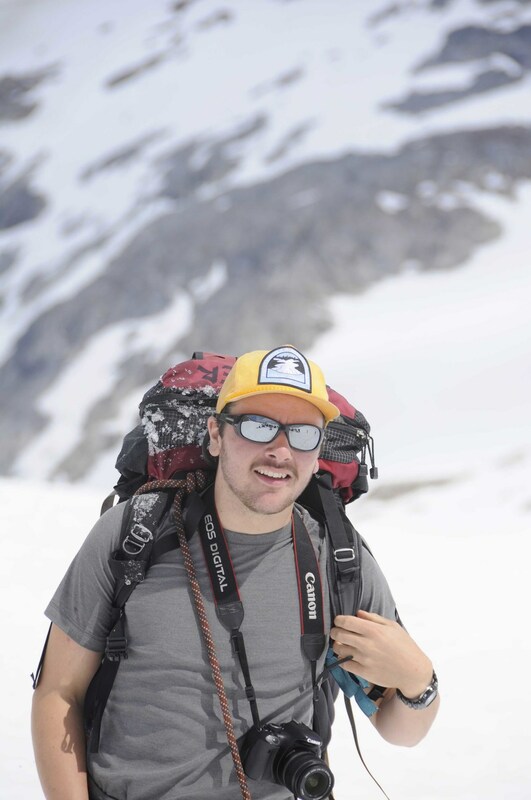 The first half of my summer was spent in the Wrangell-St. Elias National Park training to become a National Outdoor Leadership School backpacking and glacier mountaineering instructor. I am excited to work various research technician positions between NOLS contracts after graduation. This will be my second summer up on the icefield and I am extremely happy to be back here with such wonderful students, faculty and staff! Hey, I’m Kate Baustian! Like Matt, this will be my third summer on the icefield and second as a part of the FGER safety staff (with my five other super cute friends). In the JIRP off-season I live outside of Salt Lake City, Utah, where I enjoying skiing and exploring the desert Southwest. This summer, I’m looking forward to working with another brilliant, eclectic group of students while strengthening friendships with returning faculty and staff. Hey, I’m Chris. Originally hailing from Essex, MA, I’m currently working towards a Master’s degree in Earth Science at Alaska Pacific University. My favorite things about JIRP are skiing in shorts, digging as many mass balance pits as humanly possible, and thinking about science. When it comes down to it, skiing and science are the two most important things going through my head. Chris McNeil is probably listening to Sail on repeat. Hi, my name is Newt. I enjoy long walks along the power lines and evenings by the fire in a good pair of slippers. My hobbies include blacksmithing, turning bowls on a lathe, and lending out my ice screws to fellow JIRPers. Things that truly matter to me are my family, girlfriend, and dogs. While my eyes aren’t glued to the Taku Towers, or turned towards the Gilkey Trench, my time will be spent helping Ben Partan with camp repairs.